So if you’re less interested in waiting in line for “The Last Jedi” or in confirming the rumors that at the conclusion of Daniel Day-Lewis’s final performance in “Phantom Thread” he metamorpheses into a beam of divine light, I’m here to offer the cream of the Hallmark Channel, with one Lifetime contribution mixed in, Countdown to Christmas crop…based on synopsis, of course, because nothing is more fun on TV than reading the synopsis of a Hallmark Channel Christmas movie. 10. A Perfect Christmas. “Newlyweds Steve and Cynthia have a few secrets to keep as their families come for the holidays: he’s just been laid off and she’s pregnant.” OH MY GOD WHAT’S GOING TO HAPPEN?! 8. Miss Christmas. “The tree finder for Chicago’s renowned Radcliff Tree lighting is left desperate to find the perfect tree. A letter from a boy promising his tree is perfect for the ceremony sends her to a small town where she learns that his dad is not willing to part with the tree.” As a hard-bitten critic who lives in Chicago and therefore knows all about the ‘renowned Radcliff Tree lighting’, I was simply so desperate to see how they portrayed the ‘renowned Radcliff Tree lighting’ (note: the ‘renowned Radcliff Tree lighting’ is definitely not a thing) that I watched this one and reviewed it. No, really. I did. I wrote a review. Stay tuned. 7. With Love, Christmas. “Ad executive Melanie is teamed up with uptight coworker Donovan to come up with the ultimate Christmas commercial for a new cell phone. To complicate matters, Donovan is also Melanie’s Secret Santa recipient.” I like to picture a pair of screenwriters in the pitch room and Screenwriter #1 saying the first sentence and looking expectantly at the Hallmark Producer who just sort of shrugs. And then Screenwriter #2 adds the second sentence and then the Hallmark Producer gets the green light look in his/her eyes. 6. Sleigh Bells Ring. “A busy single mother begins organizing her city’s Christmas parade. While prop hunting, she finds a beautiful sleigh that seems to have a mind of its own, and it begins nudging her back to an old flame.” I always appreciate it when these movies straddle that strange line between holiday fun and outright horror. 5. A Song for Christmas. “A pop star becomes stranded in a small town in the dead of winter and finds refuge at a family's beleaguered dairy farm.” Up above is this film’s promotional photo, which is just something else. The guy with the guitar is not the pop star but the beleaguered dairy farmer, which I find funny because he looks less like a beleaguered dairy farmer than a (milquetoast) pop star, which is part of the point, I suppose, because, having seen bits and pieces of this one, I can confirm that the pop star was once part of a male/female duo, a duo that she needs to exit in order to, shall we say, Find Herself, only to Find Herself by finding herself in another male/female duo with the beleaguered dairy farmer because God forbid she just went solo and did the damn thing herself. I imagine Kesha re-making this one next year, hacking down every Christmas tree she sees and lighting it on fire. 4. The Mistletoe Inn. “When an aspiring author is dumped by her soon-to-be-published novelist boyfriend, she decides to take a leap of faith and signs up for a romance writing retreat at a quaint Vermont Inn shortly before Christmas.” It is most important to note that the aspiring author is played by Alicia Witt because while, as mentioned above, Jennie Garth will always retain the honorary Yuletide Movie MVP title, the prevailing Yuletide Movie MVP is, despite my beautiful girlfriend’s Candace Cameron Bure assertions, Alicia Witt. And she re-demonstrates her champion status here by refusing to mail this performance in, outfitting every moment with little bits of actorly business that garner five stars and luxury status for “The Mistletoe Inn.” Consider the moment where Mr. Right is feigning conversing with snowmen. Though Witt could have gone merrily overboard or played it with a smirk, she instead effects a roll-with-it earnestness that will no doubt find her picking up Best Actress at the Hallmark Holiday Film Awards the week between Christmas and New Year’s. 3. Sharing Christmas. “Michael may be able to climb the corporate ladder if he can convince the owner of a Christmas shop, Stephanie, to get on board with a plan to flip the building.” It combines the DIY derring-do of 100,000 house flipping TV shows with the whimsy of Christmas, a confection so savvy I imagine a slew of crossover attempts between Cooking and Real Housewives shows with the Hallmark holidays. 2. Enchanted Christmas. “When she left Utah as a young widow, Laura Trudeau (Alexa PenaVega) left behind her father, her love of dance -- and an old heartbreak. Now, she must return home to spearhead the renovation of a derelict hotel, which must be restored in time for a Christmas Eve benefit dance performance.” The jubilant synopsis, frankly, speaks for itself, but in the unrelentingly snow white land of the Hallmark Channel it is also really nice to see a Hispanic-led cast. Here’s to hoping for more. 1. A Very Merry Toy Store. “Two rival toy shop owners (Melissa Joan Hart & Mario Lopez) reluctantly join forces when an unscrupulous toy magnate opens a box store in their town.” Almost as good as Kat Maslich and Peter Bradley Adams reuniting* (*painfully obscure, pretentious reference), the stars of 2007’s quasi-immortal “Holiday in Handcuffs” have reconvened a decade later for a new holiday offering with an appropriately scrumptious synopsis. 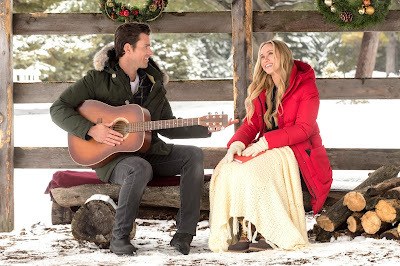 Lifetime Holiday movies rarely, if ever, match the same ol’ same-ol’ whimsy of Hallmark Holiday movies, but this is about synopsis more than the actual movie. And that synopsis combined with the name “Melissa Joan Hart”, who is like the Debra Winger of Made for TV Holiday movies, so skilled at them yet never in them enough, is gold, baby. Gold.